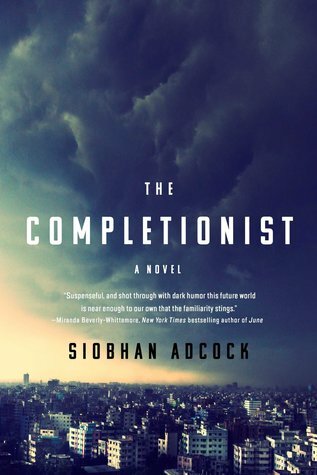 Siobhan Adcock is the author of the novels The Barter and The Completionist. She lives in Brooklyn. Natural disasters have ravaged the country leaving many without water and leaving the coasts inhabitable. Water is a precious commodity and has started to be artificially engineered. The downside is that this ne w water causes infertility. This story takes place in New Chicago. Carter Quinn is a marine that has just returned from the H2.0 war. Carter’s sister Gardner is a Completionist, one of those that help the few women that become pregnant to carry the baby to full term. Carter’s other sister; Fred has become pregnant and is preparing to get married. I love dystopian stories and I was excited to start reading this one. It was an interesting story; although there are other ways to get clean water I suspended that idea for now. Most of the population cannot have children, ok good idea. But then those few women that do get pregnant are fined for it? I do understand the strict regiments and basically making them breeding stock. Over all this is one of those books I think you will either like or hate. It’s not a bad read if you suspend belief in several areas. It is worth a read and I don’t feel like I would have wasted my money. But it’s not one for me that is screaming to be added to my shelves. I would like to thank Spark Point Studios for the opportunity to read and share this book.